Dock lighting design & installation can use a variety of lighting fixtures and applications depending on your planned use & needs. Everything from safely lighting your dock & boat area to attracting fish can be planned into your perfect design. In addition to properly planning your lighting design & installation, dock area is subjected to some of Southwest Florida’s harshest environment & weather conditions. We encourage installation of marine grade light fixtures and hardware to insure longevity of any dock lighting. 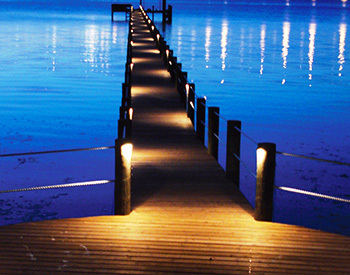 At Coastal Outdoor Lighting we have been planning, installing & repairing marine grade dock lighting in SouthwestFlorida since 2001. Not only are we a lighting company we’re also boat owners. We have maintained our own docks & dock equipment in Florida for years. 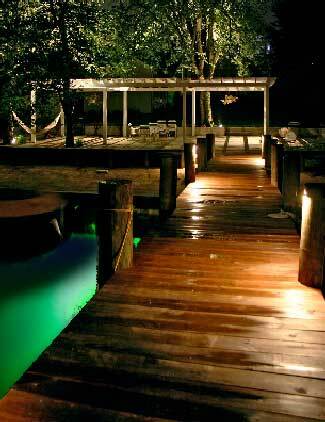 We really understand dock lighting ideas, design & applications. We only use quality marine grade dock lighting equipment manufactured by top rated companies. As a preferred vendor of these top rated companies our special pricing and support is passed on to you the property owners. When you call our office you will always speak with one of our employees. Every employee drives a fully equipped, professionally marked company vehicle that is computer equipped and networked to your entire project’s design & history. When you call Coastal Outdoor Lighting you can be sure you are contacting a fully licensed and insured Florida dock lighting contractor. Every dock lighting design starts with a “Free” Onsite Consultation by one of our trained & certified lighting designed specialists. For the very best in dock lighting design & installation please complete our online request form or for the fastest response call us today @ (239) 491-6759.